In 1803 my 4 x great-grandfather, Hector Gunn, a merchant in Thurso, was declared Chief of Clan Gunn. This grand conclusion was reached at a judicial hearing − an inquest − in Wick, said to have been convened by the sheriff at the request of Elizabeth, Countess of Sutherland. The verdict has since been hotly disputed and some, even at the time, including the respected Rev Alexander Sage, minister of Kildonan, considered Hector to have ‘usurped’ the title from those with a better claim but less interest in the ‘honours of this world’. Others wonder if there ever was such a thing as ‘chief of Clan Gunn’. The Countess had also taken an interest in Hector’s son, George, and may have helped him buy a commission in the Navy. He later became a sub-factor for the Sutherland estate in Assynt, where he served her well in overseeing the removal of tenants in the spring of 1820, and later he was appointed her principal factor, living at Rhives, near Golspie. He would work for the family for almost forty years, during some of the most controversial times in the Highlands. Hector Gunn had died by 1810 and his son George had taken on the title of Chief. This upwardly mobile young man, now a twenty-three-year-old lieutenant in the Royal Marines, must have been less than pleased when, in Edinburgh early in 1811, his younger, unmarried sister, eighteen-year-old Janet, became pregnant. The father was John Mackay, a soldier in the 42nd Regiment, known as the Black Watch. They were married at the end of August just before the regiment sailed from Leith for England and their child, Janet, was born and baptised at the barracks in Lewes, in Sussex. In April 1812 the Black Watch was embarked for Portugal. Where and when John Mackay died is not known. He had survived the disastrous expedition of 1809 to the malaria-ridden Dutch island of Walcharen, at the mouth of the river Scheldt. When the Black Watch returned the next year John was one of only 204 men, of the original 758, who were fit for duty. Their time in Musselburgh, outside Edinburgh, from the summer of 1810 was one of recuperation but many ‘indulged themselves to excess in the use of ardent spirits’. Whatever the story of how the couple met, Janet was left a widow and returned to the north where, about 1817, she was married for a second time, to William Mackay. He was probably at that time a small tenant at Scrabster, a township between Tongue and Ben Loyal, since their first child, Christina − usually known as Christy − was born there in 1818. She was my great-great-grandmother, brought up with her older half-sister, Janet Mackay, and later her nine younger brothers and sisters. She died in 1906 and my great-aunt remembered her as a determined woman, still running her croft in her eighties, although confined to bed, from where she shouted instructions to her family. In 1840, aged twenty-one, Christy married Donald Sutherland, who had also been born at Scrabster − but by the 1820s Scrabster had been cleared of tenants to enlarge the farm of Ribigill. Donald had become a farmer and herring fisherman on the coast at Skerray. Their eighth child, William, born in 1858, was by great-grandfather. And here, from my own family history, is paradox. When my great-grandfather William Sutherland was born, his father Donald Sutherland scraped a living from a share in a fishing boat and the tenancy of a four-acre croft at Strathanbeg, Tongue, on which he kept a horse, two milk cows, two ‘cattle’, eight sheep and a dog. Rent arrears were accumulating. At the same Donald's wife, Janet, had an uncle, George Gunn, who was enjoying his retirement after almost forty years as factor of the Sutherland estates, which since 1829 had included the ‘Mackay country’ where Donald had his croft. 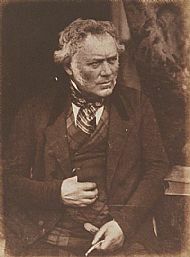 In the 1840s his image was captured by the Scottish pioneers of photography, David Octavius Hill and Robert Adamson. He appears ‘confident and self-assured and relaxed’, dressed in a waistcoat and trousers in what may be Sutherland tartan. To mark his retirement in 1853, at a dinner for 120 people held in Golspie, George, amid a flurry of toasts and speeches, was presented with a service of silver plate and ‘an extremely chaste and handsome ‘epergne’ − a table centre piece for holding flowers or candles. There was no epergne on the table at Strathanbeg. His sister, Janet, died two years later in 1855, a crofter’s wife in Clashaidy, near Tongue. Her death certificate made no mention of her first husband, the soldier John Mackay, and listed her first child, Janet, as the daughter of her second husband, William. In the society of the North of Scotland, brother and sister could scarcely have been further apart.